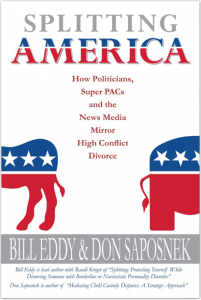 Bill Eddy and Don Saposnek, two seasoned Family Mediators, one a psychologist and one a family law attorney, recently joined forces to author their new book, Splitting America – How Politicians, Super PACs and the News Media Mirror High Conflict Divorce. They start off by pointing out that the trend is towards a more “nasty” America, and as part of this, we have “high-conflict” divorces. They then make the leap to politics where they point out that well-funded politicians are promoting high-conflict campaigns to which adults and children are exposed on a daily basis. One of their implied goals is for us to use the skills developed by family mediators that help divorcing couples avoid a high-conflict divorce and apply them to the Democrats and the Republicans in their campaign struggles. The authors present their plans for this ambitious undertaking by first establishing the similarities between high-conflict divorce and high-conflict politics. They start off with a thorough analysis as how divorce gets so ugly and then spell out three types of high-conflict divorces. If nothing else, this book serves as a primer for anyone wanting to really understand the dynamics of high-conflict divorce, as explained in simple step-by-step language by two very experienced practitioners. No other book comes to mind that makes this process so clear. The authors are always working towards us understanding the link between high-conflict divorce and high-conflict politics. They start with the fact that divorcing spouses typically blame each other for everything that has gone wrong, and that this is mirrored by the two political parties. And, if all you do is blame, there is not any likelihood of finding any common ground. The authors then, in a step-by-step method, cleverly make the link between different personality styles in high-conflict divorce and high conflict politics (e.g. narcissistic personality disorders morph into narcissistic leaders). The final analogy made by the authors is that we have “A Nation of Alienated Voters and Alienated Children” (Chapter 7). Here, they first describe each of the behaviors of an alienated child whose parents have gone through a high-conflict divorce, and then painstakingly show the political parallel. And, they reintroduce the concept of “splitting”, a theme which runs throughout the book whereby each parent or each political party is seen by the other as “all good” or “all bad.” The last chapter, “Healing a Split Nation,” highlights the fact that, until both Democrats and Republicans see the benefits of working together, we will continue to have the kind of divisive elections and “politics as usual”. The book ends with the introduction of a cleverly constructed “High Conflict Politician Scorecard”, with which you can rate the traits of politicians, such as “All-or-nothing solutions” and “Doesn’t play well with others,” and then derive a score. It would be quite a victory for all of us if we took this Scorecard into the voting booth with us. In summary, we actually have three books here. One is a primer on the personalities that become involved in High-Conflict Divorce, along with an excellent summary for both the professional and non-professional. The second book is a fascinating look on how dysfunctional the American political system really is, even in the toned-down language of the authors. And finally, “Splitting America – How Politicians, Super PACs and the News Media Mirror High Conflict Divorce” is a thoughtful integration of how two apparently unrelated systems, certainly two that function independently from each other, have so much in common. This book will leave you wondering about many things. 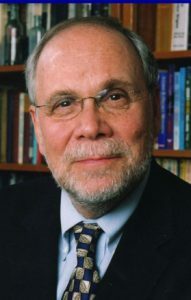 Ken Neumann is a practicing mediator and family therapist on Manhattan’s Upper West Side.